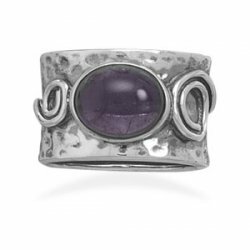 Textured oxidized sterling silver ring with coil design and 11mm x 9mm amethyst center. This ring is available in whole sizes 6-9, I would be happy to order any size needed. 2.6mm wide band features 18x8mm Baltic amber. .925 Sterling silver, made in Israel. comes in sizes 6-9. 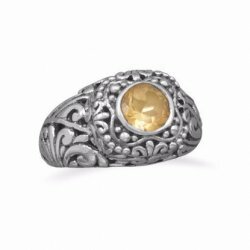 Oxidized sterling silver ornate ring with 7mm citrine. The band measures 4mm -12mm. 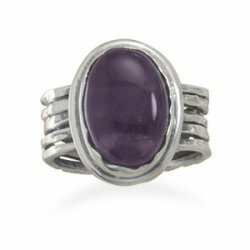 Oxidized sterling silver 14mm x 10mm oval amethyst ring set on a 7.5mm band with cut out design. This ring is available in whole sizes 6-9. .925 Sterling Silver, made in Israel. 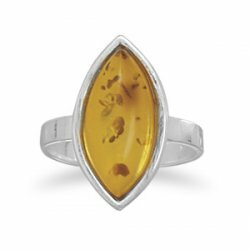 Faceted oval citrine ring. Citrine measures 12mm x 10.5mm. 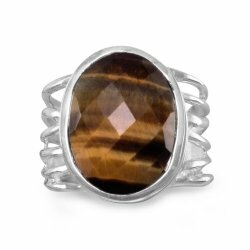 Polished cut out band design with oval faceted tiger's eye. The tiger's eye is 16mmx12mm. 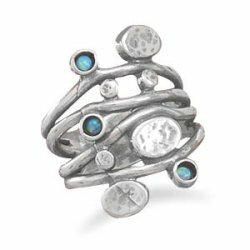 Oxidized sterling silver 4 row open design ring with 2mm synthetic opal stones. This ring is available in whole sizes 6-9. 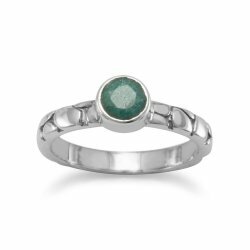 Oxidized sterling silver dyed beryl ring with 3mm cobblestone design band. The dyed beryl is 5mm. 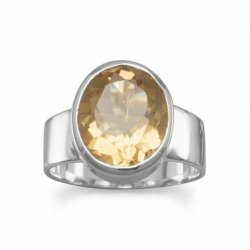 Oxidized sterling silver citrine ring. 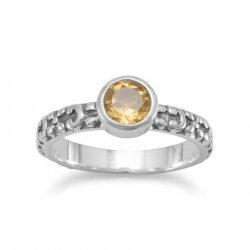 The 3mm band has a floral design; the citrine measures 5mm. 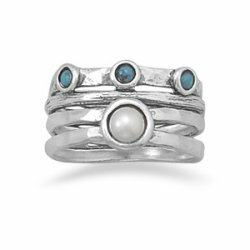 Oxidized sterling silver split band design ring with a 5mm cultured freshwater pearl and three 3mm turquoise stones. This ring is available in whole sizes 6-9. 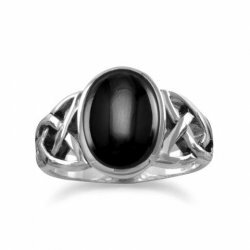 Oxidized sterling silver ring with 13mm x 19mm black onyx. .925 sterling silver, is made in Israel. In new condition. 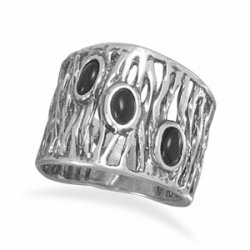 Oxidized sterling silver cut out design band with three black onyx stones. The band graduates from 10mm - 18mm. Made in Israel. 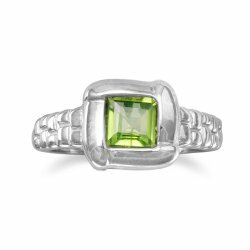 Sterling silver ring with 6mm square peridot overlap design. 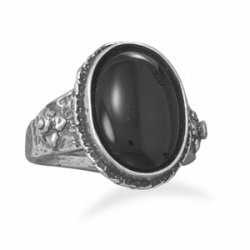 Rhodium plated sterling silver smoky quartz ring. 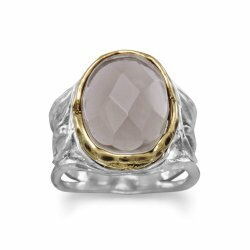 The faceted smoky quartz is 12mm x 16mm with 14 karat gold plated accent around the stone. 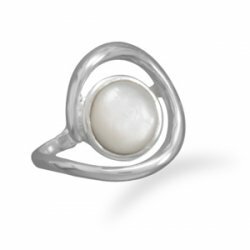 Sterling silver and white shell wrap design ring. Ring is approximately 1/2" across top. This ring is available in whole sizes 6-9. .925 Sterling Silver. Made in Israel.